Tuesday was my monthly guild meeting and usually the next day i get into a piecing mood instead of going out the longarm. 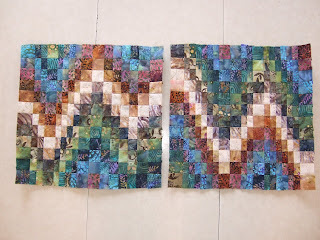 I completed the two bargello blocks that were taught during the program and then donate the blocks to the guild for comfort quilts. I really enjoyed this block and could see myself making a bed size bargello quilt but i need a reason to make a quilt so until that happens it will stay on my 'one day i'll make that' list. I was just counting how many quilts i have completed on my longarm since i got it up and running in the middle of November. So far i counted 29 and 30 is on the frame, that 's not bad for my first 2 months. I have had no major disasters and learnt to tighten the laser light on a practice free-be so no picking was necessary. Yesterday though i did try something new and that was to turn the quilt to do the side borders. It had a flannel backing and yes it did pucker a bit so i think i'll just stick to starting and stopping on the side borders. I'm sure the flannel had a lot to do with the puckers but i'm sure the client will be fine with it especially since i will give her a nice discount. Now i have been pondering what to pay myself per hour and realized i can't afford me! What to do? I guess i'll get minimum for awhile until i figure it all out.